Sealaska Heritage Institute (SHI) will sponsor a Native Fashion Show at the upcoming biennial Celebration in Juneau, in an effort to showcase and encourage the integration of Alaska Native art into high-fashion pieces. 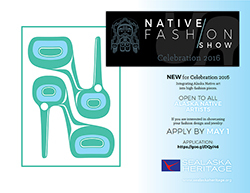 The show is open to all Alaska Native artists. Native fashion design has exploded across the country, and in recent years, more Northwest Coast artists have been making contemporary apparel and jewelry that incorporate Native designs. The show is an offshoot of Native fashion shows recently sponsored by SHI at the Santa Fe Indian Market and the institute’s 2014 Tináa Art Auction in Juneau that were hugely popular with audiences, said Worl, noting the show might become a regular event at Celebration if people are receptive. SHI formed a committee to help develop the show. The committee, which consists of artists, runway models, designers and others who have worked on fashion shows, includes Alyssa London, Crystal Worl, Maka Monture, Louise Kadinger, Jackie Pata, and Alison Bremner. Designers must apply to exhibit in the show by May 1. Applicants must be age 18 or older and American Indian or Alaska Native. The show will be held on June 10 in Shuká Hít (the clan house) in the Walter Soboleff Building during Celebration, which runs June 8-11 in Juneau. Caption: Model at SHI’s Tináa Art Auction, Native Fashion Show, 2014. Photo by Steve Quinn, courtesy of Sealaska Heritage Institute.